Children's Picture Book Database at Miami University | Ste-e-e-e-eamboat a-comin'! A steamboat that travels along the Mississippi River comes to a small quiet town. The passengers have goods to sell and places to travel. This beautiful boat helps people to accomplish their tasks. 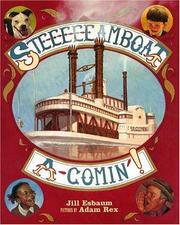 Esbaum, Jill, “Ste-e-e-e-eamboat a-comin'!,” Children's Picture Book Database at Miami University, accessed April 23, 2019, https://dlp.lib.miamioh.edu/picturebook/items/show/13863.